B&B La Fonte del Machiavelli is located in the ancient farmhouse of Niccolò Machiavelli, the famous Florentine writer of the Renaissance. The property has been completely restored in an elegant style and is immersed in the heart of the Chianti Classico area. In the morning you will wake up by birds song and admire all around cultivated fields, olive trees, cypresses, vineyards, green hills where here and there a stone farmhouse emerges. During summer you will have a good start of the day with a rich breakfast on the panoramic terrace and in the evening fall asleep among fireflies and crickets. A holiday close to nature, in the silent of Tuscan countryside, where you can regenerate, far from the confusion of the city. The family-run B&B's owners are professional and fond of, and they will receive you with warmth and helpfulness. 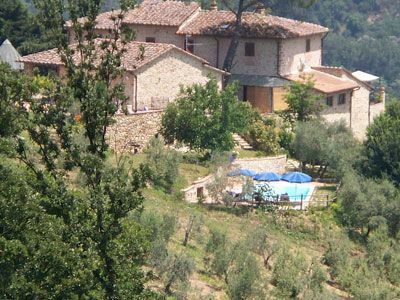 B&B Fonte del Machiavelli is located in Sant'Andrea in Percussina, in the heart of the Chianti Classico area, only few kilometres far from San Casciano Val di Pesa and 15 km far from Florence. It's the ideal starting point to visit the most important cities in Tuscany such as San Gimignano, Volterra, Siena, Pisa and Lucca. For those who like a "slow" holiday, there are some of the most beautiful and panoramic roads leaving from San Casciano which lead to the wonderful medieval villages of Panzano, Greve, Radda and Castellina in Chianti. In San Casciano, only few kilometres far from the B&B, there are all kind of shops and services and there are also several restaurants with a typical tuscan cooking. Nearby there are also a tennis court, a gols court and a manège. San Casciano Val di Pesa, 3 km from the B&B.